Penguin presents the unabridged, downloadable, audiobook edition of Reality is Not What it Seems by Carlo Rovelli, read by Roy McMillan. 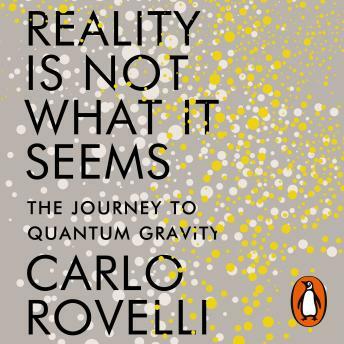 Penguin presents the unabridged, downloadable, audiobook book edition of Reality is Not What it Seems by Carlo Rovelli, read by Roy McMillan. What are time and space made of? Where does matter come from? And what exactly is reality? Scientist Carlo Rovelli has spent his whole life exploring these questions and pushing the boundaries of what we know. Here he explains how our image of the world has changed throughout centuries. From Aristotle to Albert Einstein, Michael Faraday to the Higgs boson, he takes us on a wondrous journey to show us that beyond our ever-changing idea of reality is a whole new world that has yet to be discovered. I was looking for a primer on Physics, and although I probably only comprehended 35% of the content, the characters, the historical context and the writing kept me on board. Special kudos to the narrator who really nailed the delivery. Loved the faux US-accent on the Richard Feinman parts!